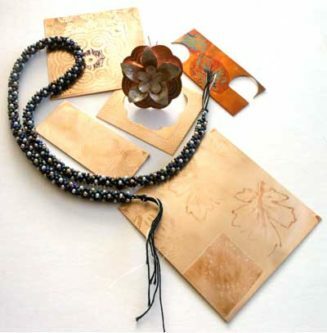 This semester I’m taking part in a wonderful project as one part of an Independent Study in metal work/jewelry construction at Front Range Community College. 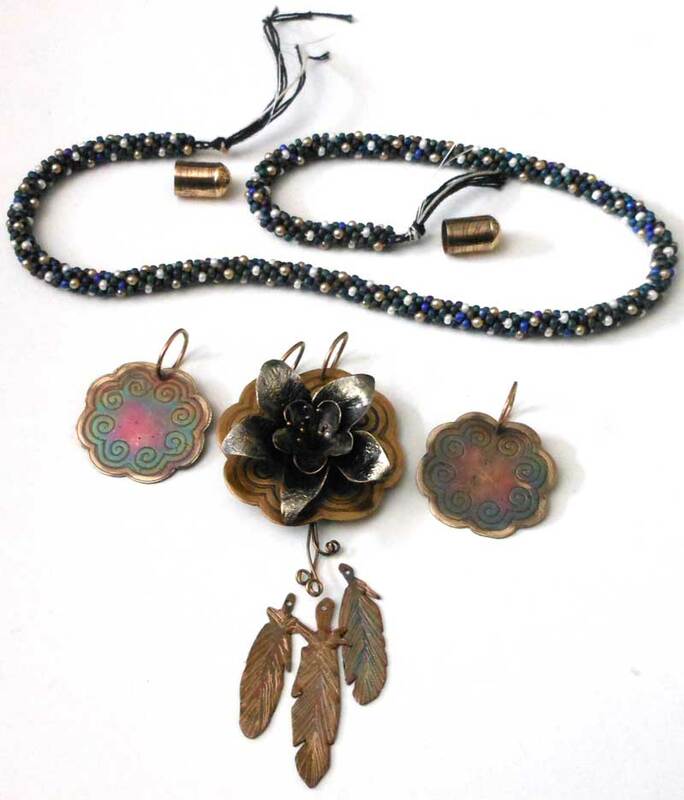 This is a service-learning project in cooperation with classes in Metal/Jewelry, Women’s Sexuality and Women in US History, honoring 11 female elders in the Boulder County Community and was coordinated by FRCC Professors Camille Rendal, Catlyn Keenan and Mary Ann Grim. Eleven residents of an Assisted Living Center consented to team interviews by the students, who also recorded the interviews in audio, video and note form before translating their results into bios in several forms including written documentation and jewelry representing each woman’s story. I thoroughly enjoyed chatting for an hour with our team of three and J*, our honoree. We had a list of 25 questions to give us starting points, and we covered them all as well as taking a few interesting sidelines, as all good conversations do. J* had originally been a bit concerned as to her abilities in answering our questions. She has trouble recalling names and dates, and as a former 30 year veteran of teaching, she knows it is important to get the answers right. Then again, her specialty was Kindergarten, and as soon as she knew we were there for her personal stories more than for the exact dates, we all got along splendidly. Dates and place names can be looked up, but the tale of what happened is another thing entirely. Sometimes those stories are oft told and reside in the family lore. Some stories get kept close in the heart and not shared but with a chosen few; and some just don’t get called up very often for lack of reason to look there. Memories are a part of our personal stories, both the ones we tell about ourselves and the ones others tell about us. J* isn’t alone in having difficulty with recall. All of the ladies that we interviewed reside in the special section for the memory impaired at their Assisted Living Center. All of them looked well cared for and happy to be there and to meet with us, and any fears on our parts of wearing out our welcome were unfounded. Our groups talked while a few students took video and still pictures. We quickly found common ground in education, teaching, and reading. J* taught for 30 years in Colorado schools, including Columbine Elementary. During her term , a significant portion of her students came from Hmong families relocated from China, Vietnam, Laos, and Thailand. Their people were American supporters during the war and were brought to America after their lives were unalterably changed and their villages destroyed. Hmong women helped their families survive the relocation camps and afford passage to America with their creation and sales of beautiful needlework. J* was enthusiastic in her appreciation for their efforts and the artwork that was done by the women and girls. She encouraged the spread of information about the reverse applique called “Pa nDau” (sometimes spelled “paj ntaub”) meaning flower cloth, inviting mothers to show and tell after classes. She delighted in making home visits with her students’ families, and received many pieces of needlework as gifts. J* told us the other teachers at school were not so enamored of her efforts to share the traditional culture and skills of the families, preferring to keep to the listed programme of studies and not venture beyond. She didn’t stop. 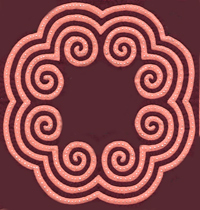 A traditional Hmong symbol that often appears is called “Elephant’s Foot” and is commonly agreed to represent family. As a needle artist myself, I am very familiar with the beautiful and meticulously done applique and embroidery work of the Hmong women. 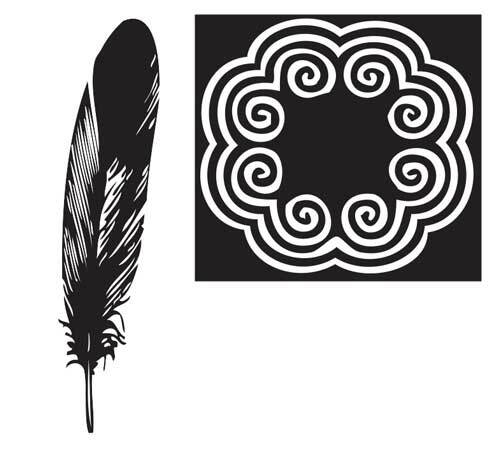 I found an example of the symbol I wanted at http://www.hmongembroidery.org/symbols.html and copied it to my desktop, then took it into Adobe Illustrator and used the Live Trace Tool to make a black and white vector graphic. (This is another great benefit to getting a degree in media graphic design at my local community college–I know how to use some fabulous programs and tools now.) I was then able to duplicate and re-size the image to my specifications and use the images to print on the special blue PnP paper used in etching metal with electricity. 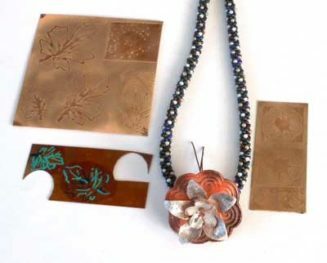 Made primarily for etching circuit boards, we use it in the jewelry department to etch metals for use in our wearable art and other projects. I love the way the patterns are slowly grooved into the metal by the current removing some parts and leaving other areas raised. We really don’t fully understand the mechanisms of memory, but there are those that are quite convinced it has to do with electricity within the brain as well as the neural links and patterns that are laid down by our perceptions. Sometimes there are grooves in the patterns that go outside the lines when too much electricity is used too quickly–and I see that as being true in metal and memory both. I used this symbol etched in bronze for the background of the central pendant and the two small side pendants representing three loving relationships important t0 J*. Parts of the image were used in the end caps as well. They are suspended from four bronze rings that symbolize her four children. 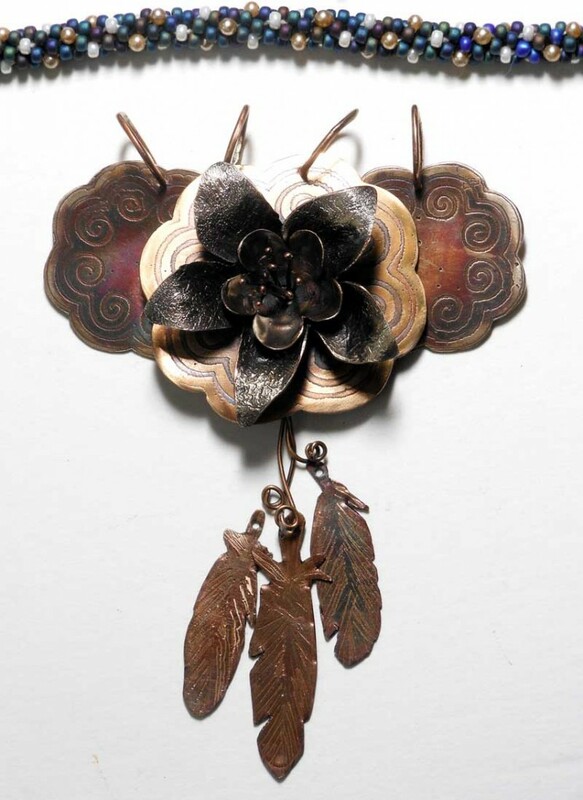 I formed a columbine flower from silver clad sheet bronze and sheet bronze with bronze wire stamens. The silver surface on the outside petals is reticulated. That’s a metalsmith’s way of saying “made it through the heat of the fire without quite melting, and having an interesting pattern to show for it”. That’s true of J* herself, as it is anyone who makes it through a long life time filled with many events. 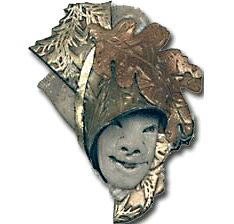 Leaves were also etched on bronze but ended up being too large for this project. Sometimes plans change–that’s part of life and art both! I also etched three feathers that dangle from the pendant and represent flight–both flights of imagination and in the air. J*’s brother was a pilot and would take her up flying when she was a girl. She very much enjoyed it, and said that if she had a magical body that would do anything at all, she’d go flying again, minus the plane. They also represent her three siblings. The beaded rope braid is another Asian art form called kumihimo, and this one uses 16 strands of beaded thread to form the braid. I feel that these again represent the four siblings of whom she was originally a part, and the four children she herself raised. Together the strands form something stronger than the individual threads, and together they show a pattern that is not seen until they come together over and over again. 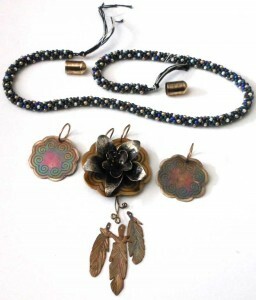 Although the colors of the beads are pearl and black, the Aurora Borealis (AB) finish on the matte black beads causes the light to reflect in such a way that all the colors of the night sky are seen; purples, blues, greens shading together. 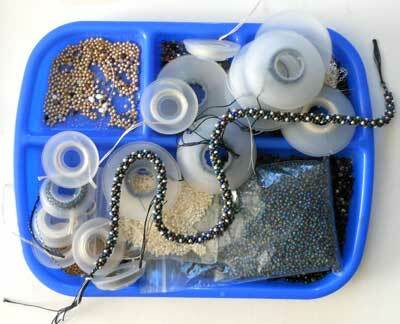 There are two kinds of glass pearl beads–shiny and new, and vintage beads in a more subdued shade. I like to think they are like stars in the night sky shining together, but some more distant and darker than others. Memories are that way too. I used Liver of Sulphur on the metals to patina them, and brought up an unexpected depth of color in some of the bronze parts. Some parts are polished back to brightness, some left with in the color of shadows. 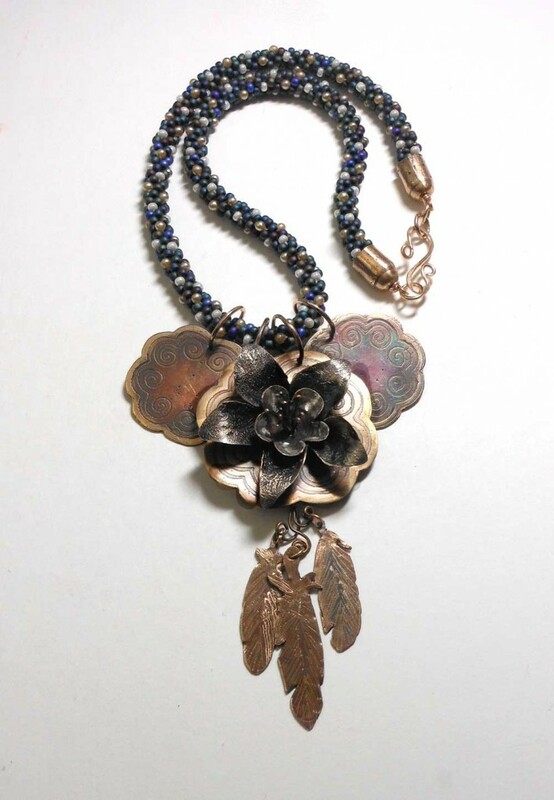 Here is the finished necklace, ready to be photographed with J*. Local artist Tony Umile’s photographs of the women wearing their jewelry will be displayed along with the bios at two events. The first is at FRCC BCC in the Community Room at 5:30 PM Wednesday, March 2oth. The second is at the Firehouse Art Center at 6 PM Friday, April 12th.